Emergency vehicles sit below the Farad Fire site on Tuesday, July 11. 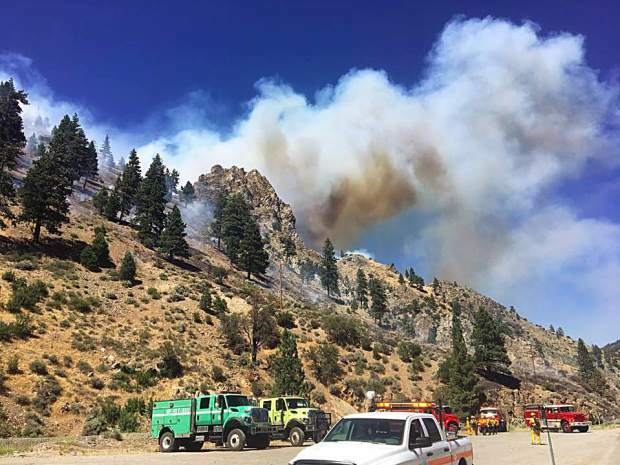 A wind-driven wildfire about 12 miles northeast of Truckee presented more challenges for firefighters on Tuesday, July 11, and created traffic woes for motorists because of the closure of Interstate 80. The blaze, which has been coined the “Farad Fire,” consumed 670 acres as of late Tuesday afternoon, and was about 20 percent contained. “Today (Tuesday) numerous crews and engines are working to suppress and keep the fire north of Interstate 80,” said Erica Hupp, who is the public information officer for the Farad Fire. She also said the fire forced a Liberty Utilities crew to de-energize a power line in the area as a safety precaution for firefighters. About 40 residents were affected by the power outage. Each of the affected customers was notified. The fire also threatened seven structures, which were being monitored. Hupp said evacuations were not planned, but it would be wise for people to have a “go bag” ready with essential items. The closure of I-80 on Tuesday was largely the result of wind not favorable to fighting the wildfire, said California Highway Patrol Officer Pete Mann, who was on-scene. He said the fire made its way “all the way down” to the interstate on Tuesday, after getting close on Monday, July 10. The closure stymied traffic flow in both directions on Tuesday with the eastbound side of I-80 backed up for miles as vehicles were redirected at State Route 267. The eastbound and westbound lanes were reopened, with restrictions, at about 2:55 p.m. on Tuesday. The Farad Fire was reported about 1 p.m. on Monday, July 10, according to incident reports from CAL FIRE and CHP. Fueled by wind in excess of 10 mph, the wildfire quickly made its way up a hillside adjacent to I-80. The rapid growth of the fire forced the closure of I-80 westbound near the Nevada state line in mid-afternoon on Monday, July 10. “In the interest of public safety, we closed (Interstate 80),” Mann said. While the cause of the fire has not been determined, there was a vehicle in the area about the time the blaze started. The sighting was noted in a CHP incident report on Monday. 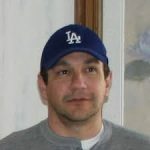 Wyatt Haupt Jr. is the managing editor for the Sierra Sun. He can be reached via email at whaupt@sierrasun.com or by phone at 530-550-2652.